Andolu Isuzu’s new 12 meter long bus, called the Citiport, is equipped with a ZF 6-speed full automatic transmission and a 6 cylinder common rail turbo diesel Cummins engine that produces 283 horsepower at 2100 rpm. 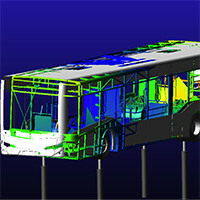 The bus can be configured to hold up to 103 people. A wheelchair ramp and kneeling system simplify entry and exit for passengers with disabilities. The bus uses an independent air suspension powered by an electric or engine-driven air pump or compressor. This compressor pumps the air into a flexible bellows made from textilereinforced rubber. The air pressure inflates the bellows, and raises the chassis from the axle. There are two air suspensions in the front of the bus and four in the rear.